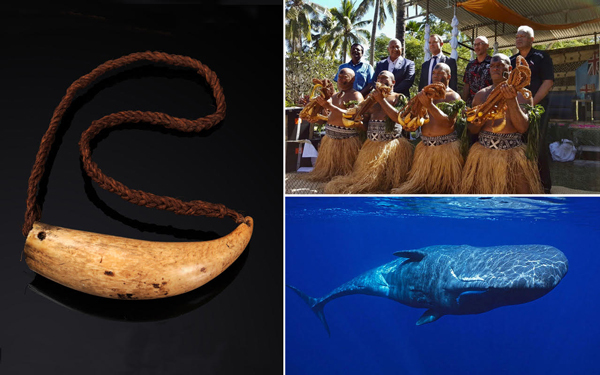 Tabua- the polished tooth of a sperm whale - holding deep cultural significance as gifts in Fiji, often passed down through generations. It is a great honour to be invited to join this unique ceremony to mark the repatriation of 146 seized tabua from New Zealand to Fiji. Today’s ceremonial event is of great cultural significance and it is inspired by a long standing tradition. It also gives us an opportunity to highlight the importance of well-regulated international trade in marine wildlife and its products on the eve of the UN Oceans Conference starting in just one week’s time. Fiji has been a global leader in making this major UN Conference happen and it will co-Chair the Conference with Sweden. This year also marks the 20th Anniversary of Fiji becoming a Party to CITES and ever since joining the Convention Fiji has championed the conservation of marine species. At our 17th meeting of the Conference of the Parties held in Johannesburg last year, Fiji successfully pushed for all mobula, or devil, rays to be listed under CITES, and supported the listing of thresher and silky sharks and the nautilus. These proposals enjoyed strong regional support, including from New Zealand, a Party to CITES since 1989. Today in Nadi, we see culture, people and wildlife come together in a way that stirs our emotions and sense of common purpose. It sends a powerful message not only here in the Pacific but worldwide of the strong links between culture, people and wildlife, which serves to enrich the debate about the conservation and sustainable use of wildlife. The tabua has deep cultural significance, which is bound by tradition. The gifting of tabua is a great ceremonial event. Its use spans across multiple generations and it is associated with offerings of war and peace, tokens to symbolize marriage, and much more. His Excellency, the Prime Minister, has spoken to these important cultural issues, which go to the heart of today’s ceremony. It was people who brought these tabua from Fiji to New Zealand without the necessary permits and people who have come together to make sure they are repatriated, which is of great benefit to local communities. We applaud the efforts of the CITES Management Authorities of Fiji and New Zealand to deal with these issues fully in accordance with CITES and in such a culturally sensitive manner. People can also make sure there is no need for any future repatriation. We must learn from our experience and do whatever we can to avoid finding ourselves in the same situation again. The Fiji and New Zealand authorities are now providing more information to travelers about the need to obtain the necessary permits under CITES before travelling internationally with a tabua or other CITES-listed wildlife. Airports can assist with prominent signage to remind travelers of their legal obligations. The costs of the lost advertising revenue will be far outweighed by the preservation of the wildlife assets underpinning tourism. And airlines and cruise liners have an equally important role to play. They have a captive audience and endless opportunities to inform and educate staff and passengers. At CITES we are working directly with the transport, travel and tourism sectors to encourage them to join us in the fight against illegal wildlife trade and with encouraging results. But we need to do more, including in this extraordinarily beautiful region with its abundance of marine life. Fiji and other Pacific Island countries are benefiting from the jobs and revenue being generated by tourism, including from cruise liners. A recent World Bank report, as a part of the Pacific Possible series, describes the impact of tourism out to 2040 as being transformational, and it can be. We also have to safeguard against the possible negative impacts of such high volumes of tourism on local culture and wildlife. A single cruise liner coming to Fiji can already carry over 3,000 passengers. Imagine every passenger wanting a piece of coral or giant clam shell, or even a tiny fraction of them wanting a tabua. Your extraordinary marine wildlife would suffer a death by a 1,000 cuts and your unique cultural heritage would be diminished. This is why we have CITES, to regulate any such trade to be sure it is legal and sustainable. We do not want to interfere with the legitimate movement of cultural heirlooms. We do however want to stop over exploitation and illegal trade in wildlife. Travelers need to be informed and behave responsibly, staff need to be educated, and local people must be actively engaged and involved. The transport, travel and tourism sectors have a central role to play in this regard and today’s ceremony allows us to spread this important message far and wide to individual travelers as well as the industry sectors. The tabua is the polished tooth of a sperm whale, a marine species given maximum protection under CITES. This protection has helped ensure this mighty animal, the largest of the toothed whales, with the largest brain of any animal on earth, survives in the wild today and will still be swimming the oceans for generations to come. The use of the tabua in Fiji for cultural purposes, the survival of the sperm whale in the wild and CITES are all compatible. By working together with a sense of common purpose, today we are privileged to see culture, people and wildlife converge in a way that lifts our spirits.